If you have a gas water heater in your home or business, you know that they are great water heater systems. They are an energy-efficient and while they use gas in order to function, they are an incredibly safe system to heat up water. When you have a gas water heater, you are able to get hot water fast in order to clean, cook, bathe, and wash clothes. While they are quality water heaters who are very efficient, they will require repairs. If you think that you need gas hot water heater repair for your home or business’s gas water heater, please call the experts at All About Plumbing & Septic. We Are the Professionals To Call for Quality Gas Water Heater Repair Service. Our plumbers are able to offer affordable and effective gas water heater repair in Mills River, Hendersonville, and Asheville, NC. Whether your gas water heater isn’t producing any hot water or it’s making weird noises, we can inspect the water heater and diagnose the problem. We have been in the plumbing business for several years and have the necessary skills and tools to diagnose the problem and provide you with the water heater repair that you need. To get in touch with a plumber to make an appointment, call our office by dialing 828-778-2425 today. In order to know when you need repairs for your gas water heater, you need to be familiar with some of the issues that can happen. Knowing what is and isn’t normal can help you get the repairs that you need a lot more quickly. If you wait too long to get gas water heater repairs, then the water heater might be too damaged and will require a replacement. Water heater replacements are a lot more expensive than repairs, so if you want to save money, you need to know when to call for repair service. Below are some ways to tell that you need gas water heater repairs. Nonexistent Hot Water: One of the most common reasons that a gas water heater needs repairs is that there is no hot water. If you are experiencing a lack of hot water, please call us for repairs. Inconsistent Temperatures: Another thing that people might notice is that one minute your water will be hot, then cold, then hot, then cold again. Inconsistent temperatures need to be addressed so they can be fixed quickly. Water Tank Leaks: If there are drips on the side of the hot water tank or a puddle of water at the base of the tank, then that means your water heater is leaking. Rusted Tank: When a water heater is to air and water, then oxidation will take place and cause the tank to rust. Water Discoloration: Not only can the water heater tank rust, but components inside the water can rust which then causes the water to look rusty. Off Taste: Typically when there is rust in your water, it is also going to make your water taste pretty metallic-y. Smelly Water: Your water should not have any smell to it. Your water might need water filtration, but if it’s a recent development, then it’s probably because there is rust in the tank. Odd Sounds: Do you hear banging or cracking noises coming from your water heater? Call someone to look at the right away. If any of these sound familiar to you, call our plumbers to get gas water heater repair in Mills River, Hendersonville, and Asheville, NC. We can inspect your gas water heater and figure out if it needs repairs or if it has to be replaced. Are you interested in a gas water heater for your home or business? 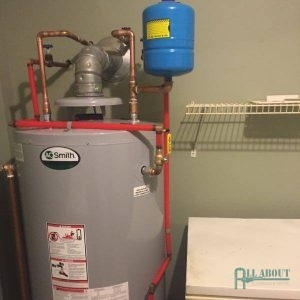 At All About Plumbing & Septic we are able to repair and replace a gas water heater, and we also offer water heater installation for gas water heaters. While you might be tempted to install your gas water heater on your own, it is important that you get a licensed and qualified plumber to handle the job. When a water heater is installed improperly, it can end up causing issues with the water heater. If You Want a Gas Water Heater, We Can Offer Installation Services! With our help, we can make sure that your gas water heater is installed correctly the first time around. 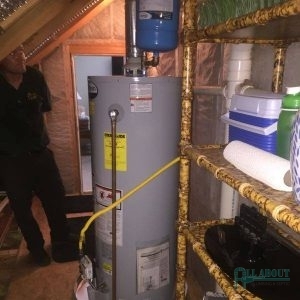 Whether you need us to install a gas water heater or your current water heater needs gas water heater repair in Mills River, Hendersonville, and Asheville, NC, we are here to help you! Just call us at 828-778-2425 if you want to set up an appointment or you want more information about gas water heaters. While most people think that gas water heaters aren’t safe, that couldn’t be further from the truth. Yes, they use natural gas in order to heat your water, but gas is one of the safest sources of energy and it’s eco-friendly. If there is ever a situation where you think you might have a gas leak, turn of your gas water heater and call your gas company. After that, you will want to call someone to repair your gas line. Although a gas leak could happen, it’s not likely, and things are added to gas in order for you to smell a leak. Not only is gas one of the safest and most reliable sources of energy, but there are also other reasons why a gas water heater is something that a lot of homeowners and business owners choose to heat up their water. Below are some of the advantages of getting a gas water heater installed in your home or business. Running a gas water heater is very affordable. Gas water heaters are able to heat up your water incredibly fast. They are very well insulated so the water heater doesn’t have to use a lot of energy to keep the temperature comfortable. They are very easy to install, which means you get your water heater installed in a day. They are able to recover a lot more quickly than most water heaters. When you need services such as gas water heater repair in Mills River, Hendersonville, and Asheville, NC or you want gas water heater installation for your property, dial 828-778-2425 now! We can work with you to get the gas water heater services that you need. Updated on January 22, 2019 at 12:25 pm by All About Plumbing.